The Agua Azul Hotel is a great choice for those looking for a beach holiday, with plenty of activities going on locally, being just 400m from the beach, it’s a popular choice. Surrounded by lovely gardens, the pool area is large and has an outdoor bar. Only had a 4 night break here. We got it at a good price through Wintersunshineholidays. We booked the hotel primarily on Location and Price. We prefer if possible now, to stay near the old town, but within easy access of Levante area and beach, and this hotel filled that remit. As we mainly eat out at night, we also wanted a low cost option, and again we cant grumble on price either. The hotel is 3 Star and on arrival we found it to be very clean and modern in appearance. The man on reception when we arrived was efficient enough, but could have been a touch more affable we felt, in fact we have the same opinion about all the staff here we came into contact with. Basically just people doing there job, which was ok, nothing to conplain about, but would have been nice to encounter a smile or two!. The rooms again we fine, nice and clean, a bit basic, with rather dull lighting, but adequate enough for a short break. 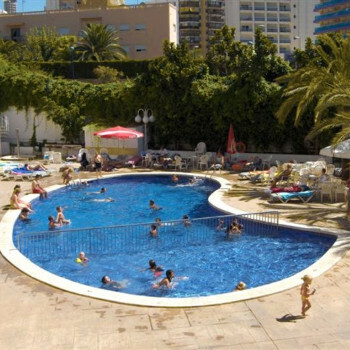 As we were out every night we cannot vouch for the entertainment, but a duo was advertised (mainly for Spanish clientel) we would feel, and Bingo advertised too, so based on that, I would say rather limited, but you have a wealth of entertainment on your doorstep...it is Benidorm afterall! The food too can only really be described as basic. Nothing offensive, but a rather small selection of choices a Breakfast (which we tried every day) and also at Dinner (which we checked out Twice, but just eat once). In fact the nice we ate was apparently "Especial Cena" But the only difference from the other night was fresh prawns and sardines. In fact they were still serving the same type of Sausages and cold tinned tomatoes from breakfast, so it wasnt a gormet experience, and for a 3 star hotel, we would have expected better. The pool area seemed ok, although pool being drained when we were there (2nd week Jan), so wouldnt have expected to use it then anyway. You may get a fair bit of noise sunbathing there in summer though as its on a busy road, but its onlt 10 mins to the beach. Overall, although the location was superb for us, we left rather dissapointed by the Agua Azul, and would only stay again if we got a really good price, purely because of its location. We went on holiday because I was going into hospital so my husband booked this hotel. We got there at lunch time and as soon as you walked into the hotel it was lovely. It has just been done up. Very clean maids were very nice indeed. Food very basic but overall it was a nice weeks holiday indeed.